It’s been awhile. I know. Such a long time, in fact, that I forgot my login information for this site and had to request a new password. In any case, I’m back, and I’ll catch up soon. In the meantime, Wee P would like to wish you a happy, prosperous Year of the Tiger. I’m teaching a course called Cultural Psychology this semester. I’ve taught this course before, but it’s a lot more fun for me (and hopefully for my students) this time around, as I’m able to draw so much from my experiences in China as I prepare my lectures. I’m using a lot of my photos from China in my lecture slides, so I’ve been spending a lot of time going through the thousands of shots I took during our five months there. As a result, I’ve been feeling really nostalgic lately. It took me a few seconds to remember why I had taken so many photos that don’t seem to highlight anything particularly interesting – they’re just shots of streets inside Tsinghua University’s campus. Then I remembered that those photos had actually served as my one and only way-finding aid during those first few weeks. In the days before we knew our way around and before could get our hands on a map written in English, the only way I could ensure I would ever make it back from the grocery store four blocks away was to take photos at every intersection on my way there and then refer to them on my way home. I felt sort of pathetic walking around staring at my camera, but in those days of hard-core “blooming, buzzing confusion,” it was the best I could do. It certainly worked better than our other strategy, which involved handing a map to P to see if she could make any more sense of it that we could. Eventually, we developed more effective ways of orienting ourselves outside. 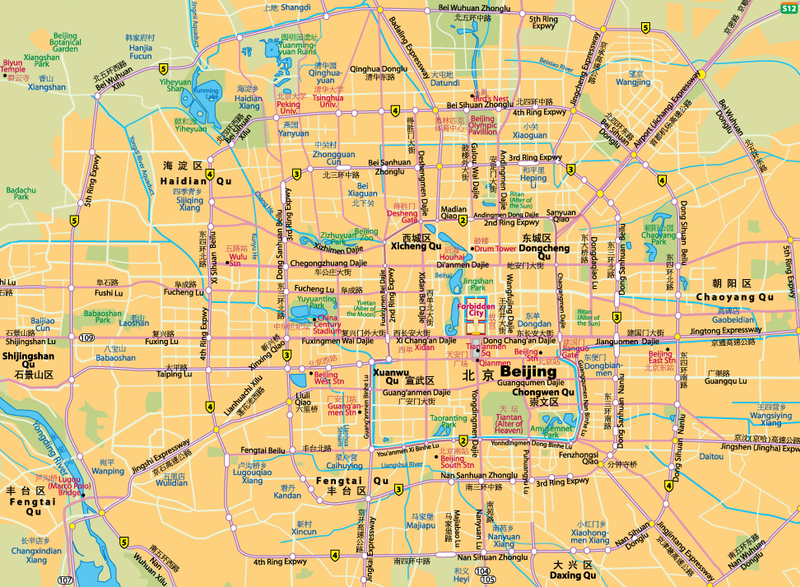 For example, we found that the omnipresent smoke stacks around Beijing could do more than just fill the air with thick, yellow smog; they could also serve as really useful landmarks to help us find our way home. Our favorite smoke stack was right outside our apartment, and we began referring to that symbol of home affectionately as “Old Smokey.” As I was looking at old photos this morning, I was surprised by just how many shots prominently feature Old Smokey. Then it occurred to me that that pollution producer was, in a way, our only friend in China during those chaotic first weeks. I also found this photo this morning. It’s our washer. I carted around this photo for weeks trying to find a translator who could tell me which buttons to push and where to pour the soap. It wasn’t until mid-March that I discovered I had been washing our clothes with fabric softener. Those days were rough. The worst part was seeing how hard the transition was for P. I was reminded of P’s first days in China yesterday when I took her to the doctor for an ear infection. Here she is waiting for the doctor to examine her. She looks like she’s on death’s door, doesn’t she? In reality, she wasn’t all that sick. I think she was just terrified of the doctor’s office, and I have to think the reason for her intense fear had to do with the fact that the last time she saw a doctor was during her “physical check” at a Beijing hospital our second week in China. Here’s a short video I took of the scene in the waiting room that day. I’m pretty sure it was that hospital visit that initiated P’s three-month-long nervous habit of gnawing on her hands and clothing. I also think it was that experience that caused me to look a whole lot like this for the next few months. Gosh, this has turned into a real Debbie Downer-esque post. Sorry for that. In an effort to end on a more uplifting note, here’s a photo from last February that makes me smile, not twitch. Christmas was good. We left on the 22nd to make the seven-hour drive to Arkansas to see my parents. As always, P loved every minute of her time there. Wee P, on the the other hand, received an early Christmas gift of two new molars and two new eye teeth and therefore acted like an enraged demon child throughout our entire visit. I’ve never been terribly cautious about what P watches on TV. Mostly, this is because P polices herself fairly well and only watches a handful of what I consider to be age-appropriate cartoons. Her current favorites are Max and Ruby, Curious George, Little Bear, and Calliou, and other than my occasional concerns about how some of these shows present gender roles (can’t Ruby do anything but nag? ), I’m not too bothered by P’s TV viewing. Wee P, on the other hand, concerns me. Or, more accurately, her father concerns me. I walked in last night and saw this. My Aunt Mamie died on Thanksgiving morning. She was 96. I wasn’t the best niece to her, and unlike my sisters, I rarely visited her in the nursing home. I also failed to make it to her funeral yesterday, so in an effort to do right by her for once in my life, I’m dedicating this post to her memory. Although Aunt Mamie never had any of her own, she loved babies. Loved them, I say. If you merely showed her a photo of one, she’d immediately begin proclaiming her love to the pictured tyke and wouldn’t stop until she’d said, “God love your little heart,” and “I want to just eat you up,” a dozen or so times. But, oh man, if you showed her a real, live baby? And if you asked her to hold said real, live baby? Step back and watch the true love fest begin. Here’s Aunt Mamie with a four-week-old P.
We just got home from our Thanksgiving trip to Arkansas. It was a good time, filled with loads of traditional American Thanksgiving activities, like food preparation. On the Importance of Being Perceptive. The following is a passage from The Complete Idiot’s Guide to Bringing up Baby. I noticed a bulletin board at P’s preschool today labeled, “How to Cook a Turkey.” It seems the teachers had asked the kids how their parents cook turkeys and had then transcribed the responses verbatim on cut-out turkeys. I was nervous as I looked for P’s turkey. If it had been a board about preparing macaroni and cheese or corn flakes, I would have been much more confident about how I had likely been represented. But a turkey? I was really expecting P’s response to be a lot like little Clayton’s. Halloween this year was extra special, as we had an extra special visitor. Have you seen the wildly popular People of Walmart website? If so, do you think it’s wrong to submit photos of one’s own children? I’m thinking it probably is.